From September 24 to 27, 2017, Professor Jianhua Lin, President of Peking University (PKU), and his delegation spent four days in Greater New York area for a series of events including China-U.S. Young Maker Summit and U.S.-China University Presidents and Think Tank Forum, during which they also visited outstanding representatives of Chinese-Americans and attended the Peking University Alumni Association of Great New York Boya Forum. Yuning Li, Secretary-General of Peking University Education Foundation (PKUEF), Hongwei Xia, Director of PKU Office of International Relations, Dongmin Chen, Dean of PKU School of Innovation and Entrepreneurship, and Lin Zhao, Director of PKUEF Department of Business Development, accompanied President Lin during the visit. 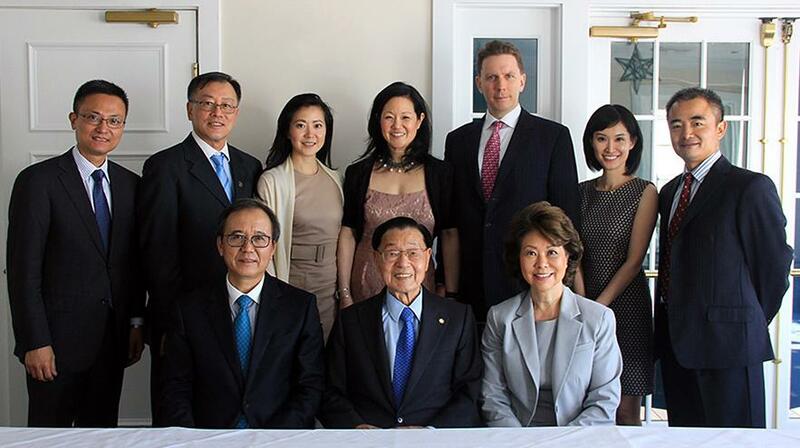 In the morning of September 24, President Lin and his delegation visited Dr. James S. C. Chao, Founder of Foremost Group and a famous Chinese-American entrepreneur and philanthropist, and his family. The delegation was warmly received by Dr. Chao and his daughters, Ms. Elaine L. Chao, United States Secretary of Transportation, Ms. Angela Chao, Chairman and C.E.O of Foremost Group, and Dr. Grace Chao as well as her husband, Mr. Gordon Hartogensis. President Lin recognized and highly praised the Chao’s family as the representative of the most prominent Chinese-Americans and an important bond of cultural exchange between the two countries. During his introduction of the recent main reform and development initiatives of PKU as well as the preparation of the university’s 120th anniversary, President Lin pointed out that a good university should lead innovation and cultivate future leaders. 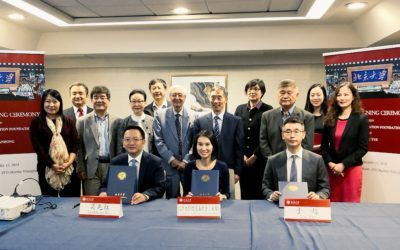 Beyond that, PKU has been also making significant contributions to the promotion of China-U.S. cultural and people-to-people exchange throughout the years. Dr. James Chao again expressed his warmest welcome to the delegation, and said that he has long been yearning for PKU as it is one of the top universities in China. 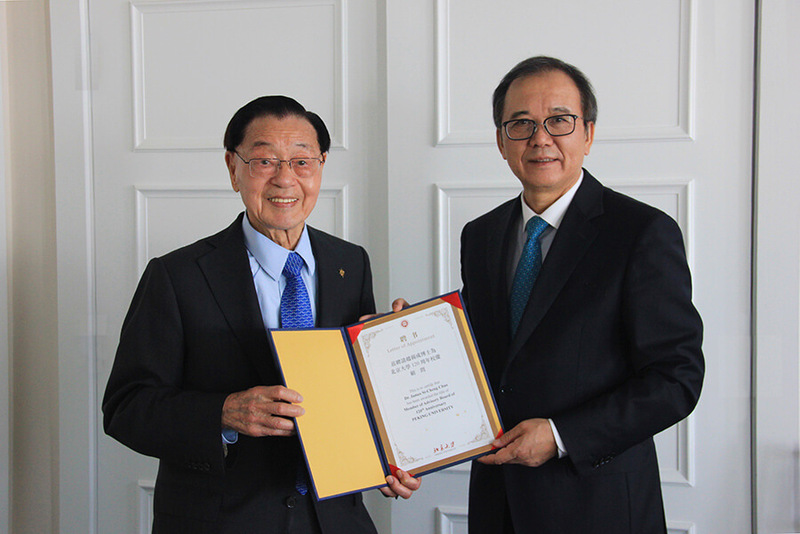 Therefore, Dr. Chao gladly accepted the appointment of joining the Peking University Advisory Board of 120th Anniversary. At the end the meeting, Ms. Elaine Chao and Ms. Angela Chao also shared with the delegation that their parents have an extraordinary confidence and persistence in the inheritance of Chinese traditional culture, and it has profound influence on their family education. 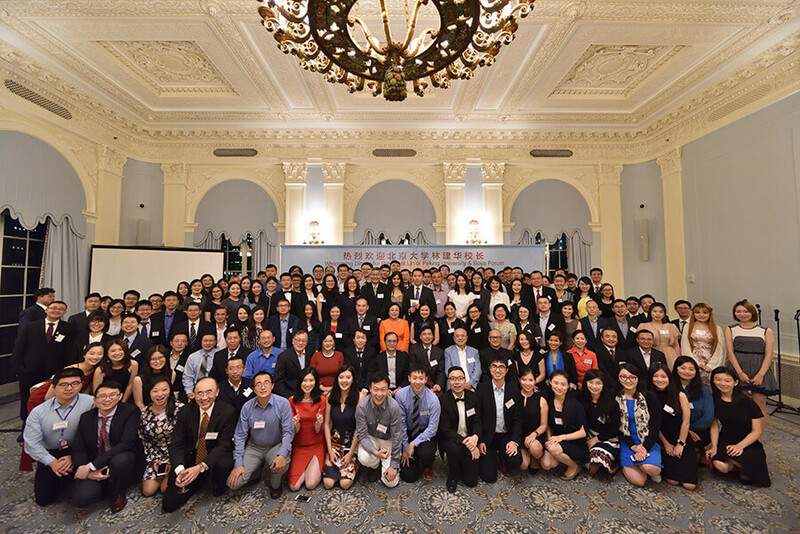 In the evening, President Lin delivered a keynote speech on “Sharing the Future” at Peking University Alumni Association of Great New York Boya Forum at Yale Club, and reported the university’s general development especially the most recent breakthroughs in research and comprehensive education reform. More than 200 PKU alumni working or studying at the Greater New York area came to join this event. President Lin said that all the developments could not have been made without the firm support from PKU alumni from all around the world. This Forum showed everyone the alumni’s deep love to their alma mater, and this emotional bond shall always inspire the university to further improve its efforts in building up a better platform for the progress of PKU together with its alumni. On September 26, President Lin visited alumni who work at the United Nations, and discussed with them regarding PKU students’ internship and employment opportunities at international organizations. 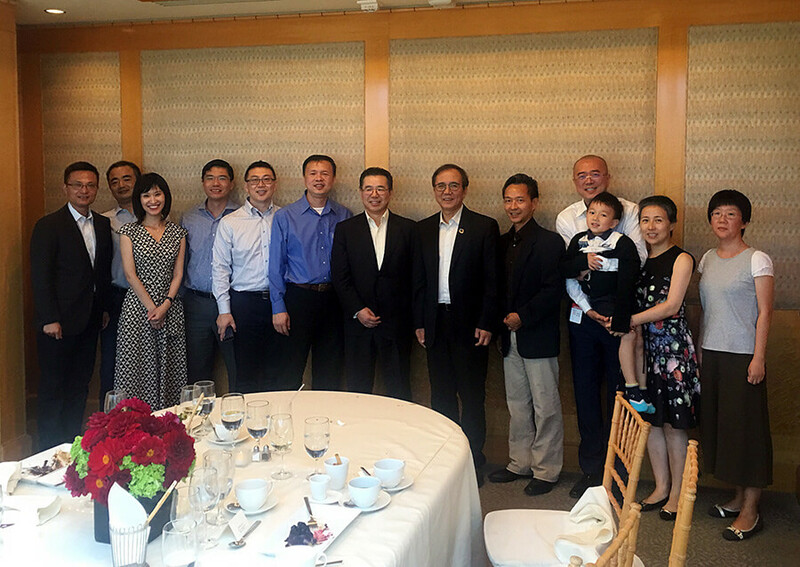 On September 27, President Lin and his delegation were invited by Wall Street alumni representatives for dining, during which they had an insightful discussion on the topics of PKU 120th Anniversary, the difference and comparison of higher education between China and the U.S., and so on. The alumni have all provided great advice based on their experience and expertise, and actively expressed the willing of supporting their alma mater’s development. 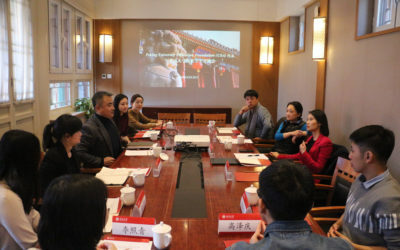 During this four-day visit, President Lin and the delegation have had wonderful conversations and discussions with New York alumni and friends who are paying attention and willing to support the development of PKU, during which all of whom have voiced their advice and suggestions on bridging PKU and the North America Area for better corporations. In the future, they hope to expand the channels and provide convenience for China-U.S. communication, to further enhance the people-to-people exchange between the two countries, to create more opportunities for corporations between students, scholars and educational institutions from China and the U.S., thus to bring more positive energy for the long-term healthy development of China-U.S. relations.